On November 26th the New York Times ran an Op-Ed piece written by Warren Buffett. In the article Mr. Buffett makes an argument in favor of raising tax rates on the wealthiest Americans. His article starts off with a hypothetical scenario where a person is offered an investment opportunity that is supposedly very attractive. The person being offered the investment says that he would rather not invest because of the taxes that he will face if the investment is successful. Mr. Buffett suggests that no one would ever use that rational; people are always interested in economic gain, regardless of the tax consequence. At very least the investor will want to obtain a greater return than his savings account has to offer. Mr. Buffett follows the hypothetical scenario with some interesting factual review. Between 1951 and 1954 Capital Gains rates were 25 percent and marginal rates on dividend income were as high at 91 percent. From 1956 to 1969 the Capital Gains rate was 27.5 percent with marginal rates in the high 70 percent range. The author then points out that GDP and the employment rates grew during these onerous tax environments. Mr. Buffett points out that the Forbes 400 wealthiest individuals have roughly $1.7 trillion in net worth. I want to emphasize Mr. Buffett’s thesis “The ultrarich, including me, will forever pursue investment opportunities.” Mr. Buffet is convinced that these Forbes 400 folks are always seeking opportunities, regardless of the tax environment, and therefore we should impose higher tax rates on their income. I agree with the idea that higher tax rates will not pose a financial burden upon them; however, I strongly disagree with the purported effect that this tax increase will have on the economy. I want to point out another new story that I read recently about the growth of savings deposits in the US, as reported by the Federal Reserve. First, look at the below chart (thanks ZeroHedge.com). 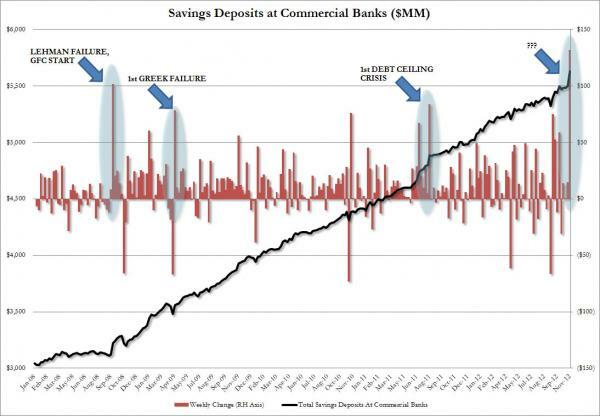 You will note that total savings deposits in US commercial banks are approaching $6 trillion. Next, you must consider the weekly percentage change in this savings deposit amount (red bars). The Lehman collapse of 2008 was obviously a very detrimental event in terms of its effect on GDP growth. The 1st Greek debt failure and the US sovereign debt crisis were also events that caused investors a great deal of concern and led them to increase their savings accounts – they pulled out of ‘risky’ investments in favor of the safe bet. We must realize that these deposits are held in plain vanilla savings accounts that are earning almost zero interest, even the humble Money Market accounts are not included in this metric. It is also worth noting that savings deposits of this magnitude are not materially affected by low and middle class Americans. With the average US savings rate around 3.3 percent it is obvious that these Americans do not move the needle when it comes to aggregate savings deposits. These deposits are owned by Warren Buffett and his buddies in the Forbes 400 list. The most stunning part of this chart is the most recent week in the time series. The week just prior to the recent US presidential election the level of savings deposits grew by $132 billion! This is the largest weekly growth in savings deposits in a week in recorded history. Political scientists and economist can debate the causality of this phenomenon, but in my opinion it is obvious that the richest Americans are scared and want to find the safest place for their money. They are worried about tax rates going up in 2013, economic stability, and myriad other economic factors, but in the end they are not investing and they are not stimulating the economy. They are also, and certainly, not “pursue[ing] investment opportunities”, regardless of the tax regime, as Buffett suggests. To get back to Mr. Buffett’s article, should we then support the government in confiscating the income of these wealthy individuals? Or might it be better to focus on finding ways to promote GDP growth? It is clear to me that all of these wealthy individuals could have an extremely beneficially impact on the economy if they felt comfortable enough to take that money out of their savings accounts and put it to work in the economy. These rich folks have a unique ability to affect the economy given the scale of their wealth. I would prefer to see Congress enact policies that rewarded investors for taking risk and stimulating economic growth rather than focusing on the contrary. The fact is that there are almost $6 trillion is assets sitting on the sidelines that will not generate one single dime of tax revenue if the government can’t provide an attractive environment for these wealthy individuals to invest in. I agree with Mr. Buffett on his point that Congress should act immediately. However, I would prefer that they act to instill confidence in the economy – confidence that the government is not going to muddle around and try to manipulate our ability to generate wealth. Mr. Buffett makes an eloquent argument about he and his friend’s resilience and low risk aversion; however, the Federal Reserve data makes it clear that while they talk tough they are actually stuffing their cash under the mattresses at faster rates than at any other time in history. Iron Condor: The wimpy option trade! I have been trading options for a few years now and have logged over 4,000 trades. In that time I have become quite familiar with the risks associated with trading naked options. I will say that I love trading naked options. Writing naked calls when a stock is overbought and writing naked puts when a stock is getting unfairly beat up is a great way to trade. The risks associated with these naked positions require nerves of steel and careful risk management. The problem is that these 'risky' options often offer enticing rewards for those that can stomach the risk. In the last few years I have often looked at the cost to protect these options only to decide to sit the round out and wait for a better set-up. Market dynamics in the last few months has caused somewhat of a change in the market. Protecting these naked positions with long options has become quite reasonable. For example: using options on Apple's stock ($AAPL), right now a trader can execute a trade to write puts 6 percent below the market price and simultaneously buy puts and the next lowest strike price and keep a net $1.00 in premium per contract. At the same time you write calls 8 percent above the market price and simultaneously buy calls at the next highest strike price and keep another net $1.00 per contract. This gives the trader a net $2.00 in premium and limits the total risk to $3.00 per trade. As long as Apple stays within your 14 percent range for the next 45 days (Dec '12 Expiration), you keep your $2.00. Of course there is a fairly good chance $AAPL will have more volatility than that for the next 45 days. However, there is always a degree of risk in this market and a reward over risk ratio of 0.67 looks pretty attractive. So, if you're too wimpy, like me, to accept the unlimited risk of trading naked options, an iron condor just might be the ticket.